This card was inspired by Karen's (Snippets) card " A little birdie told me". I just loved the look of her card and wanted to create one similar. 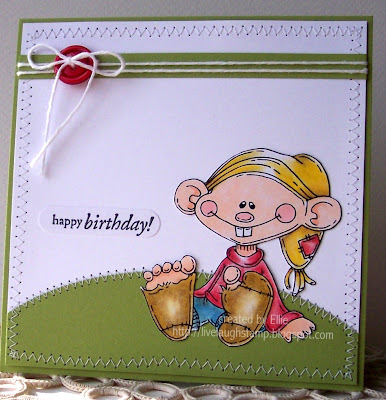 I wanted to use a birdhouse stamp too, but then decided instead to make a birthday card with this "Happy Little Gnome" from Whimsy Stamps (Meljen's collection). He has been colored with my Faber Castell Polychromos pencils, blended with baby oil. The sentiment was actually stamped right onto the white card front, but turned out crooked so I had to stamp it again and punch out using Stampin Up's word window punch. I embellished with some twine and a button, and then sewed the edges. Wow! I just LOVE this card! Your coloring is just outstanding and the sewing is so perfect! Thank you so much for sharing your talent with us this week at Meljen's Designs! Wow, what a Fab and fun card, simple but adorable, ur colouring is ace.. I love how you stitched a hill behind this adorable gnome! Oh, this is super cute! Love how he's sitting on a hill! Thanks so much for joining us at Meljen's Designs!